Twelve Days of Doujinshi, Day 9: All aboard the FRIEND SHIP! ‘Kay, let’s all save my fragile ego the trauma of being shattered so late in the game and pretend I posted this an hour and a half ago when I should have. Alright? Awright. 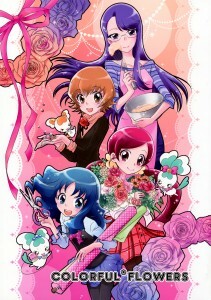 Also, I love Pretty Cure and no one – NO ONE – can convince me it can do any wrong. Except Suite. Suite just never clicked with me. THIS DOUJINSHI IS ABSOLUTELY PERFECT, PERFECT, PERFECT It’s straight-up friendship fluff, and that’s the best you could ever ask for from a mahou shoujo anime. Worth every penny of the small fortune I had to spend over at Toranoana to get it. This chapter was brought to you by yours truly typesetting and translating, and Melfra for scanning and editing. Easy ’nuff! Go read it!